from 3 pcs. 43,66 EUR ea. from 10 pcs. 40,82 EUR ea. from 20 pcs. 39,44 EUR ea. from 40 pcs. 38,22 EUR ea. A diameter of 30 mm is actually an absurd size for a sphere magnet - what shall we write about this huge sphere with a 40 mm diameter? 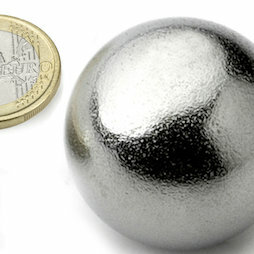 Let's give it a try: A single sphere has an adhesive force of over 23 kg! It is practically impossible to separate two of these magnets by hand - you would need the help of a table edge. Such a large sphere magnet is not really useful, unless you can think of something besides "bragging"? In that case we look forward to hearing from you. As with all large sphere magnets, the surface coating will not last forever, since the point-shaped contact areas are exposed to enormous forces.